Are you rugged and robust yet also suave and sophisticated? 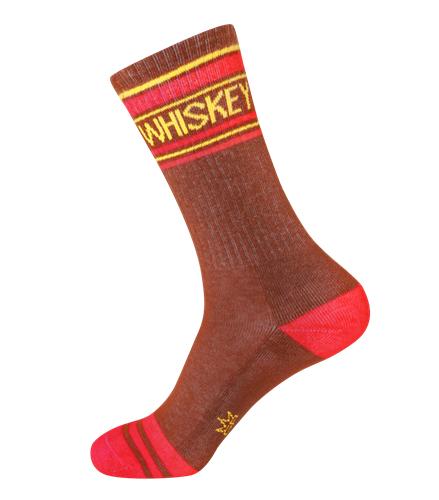 If so, then these WHISKEY gym socks are the perfect sock for any occasion. Luxurious brown cotton with bold yellow lettering and red accents, is stretchy, sleek and durable, ideal for either that Canadian Club, Old Fashioned swingin’ soiree or your good old, Jack and Coke bender. One Size Fits Most. 75% Cotton, 17% Polyester, 5% Spandex, 3% Rubber. Made in USA. These wide ribbed socks reach to mid-calf on most folks and fit a women’s size 6 US to men’s size 15. As a thicker weave, these socks are optimally worn with sneakers and other roomy shoe styles. Machine wash cold, line dry.